LUCY BURDETTE: Like my character Hayley Snow in the Key West mysteries, I was born and raised in New Jersey. We had sledding parties, and ice skating parties, and a real Christmas tree cut from a neighborhood farm. We served hot chocolate and sugar cookies to Santa, and carrots to Rudolph and company. There was a candlelight service on Christmas Eve and piles of presents and many relatives and a roast turkey on Christmas day. And here is where we'll be on Christmas eve--MCC Key West, where all are welcome! *Historical note from Rev. Steve Torrence: The original Christmas parade was put on by the lower keys ministerial association. They would not allow MCC or the Key West business guild to participate. The mayor of Key West said: "That's not how we do things here." They sponsored the KW holiday parade and invited everyone! How do things look in your town during this season? I love all the decorations and the parade and the celebrating . . . Here there are lots of houses and yards bearing decorations and lights, several parades, tree lightings, caroling, hay rides, a Christkindlmarket at the seaport, a Dickens Festival, Christmas Eve candlelight services, and, of course, Breakfast with Santa [which is where I will be in just a little while, with grandbabies Isaac and Mia] . . . . I haven't been out to look at the lights yet this year. We had a really lovely Christmas concert on Tuesday, so I've been spending my nights indoors in prep for that. But I do have to say, the historic side of my town usually puts on a pretty remarkable light show. Around the corner from me a family has set up a display with an old pickup truck--Santa's personal truck, if we can believe our eyes--fake snow, and lots of lights, with the invitation to come take your holiday family photos with this as a background. So far, we've had rain and drizzle and general miserableness on the weather front, but no snow in the forecast. I'm betting we'll see plenty of snowmen of the inflatable kind, however. At Thanksgiving we had one 3-block area of Church Street that sported twelve identical inflatable turkeys, which had to have been coordinated, and was just a little surreal. Inflatables are popular here. I'm still trying to figure out where the Christmas T-rex came from. Anybody know? I even caught a glimpse of the Christmas T-Rex in a church pageant video last week. I guess he hangs out with the two lobsters and the octopus? I envy you the concert. Is it on you tube yet? I don't think so, but you could always just buy/stream the CD. It's called "Horns for the Holidays," and it's good. The liner notes are exceptional. Have a blast with Santa Joan! Ottawa is guaranteed a White Christmas with snow on the ground, freezing temperatures and more snow falling today and on Christmas Day. Living in Canada's capital city, Ottawa's downtown is very festive with the Christmas lights lit up along the main streets. At Parliament Hill, there is a nightly sound and light show projected right on the historical buildings. All in all, it is a magical place to be for Christmas. 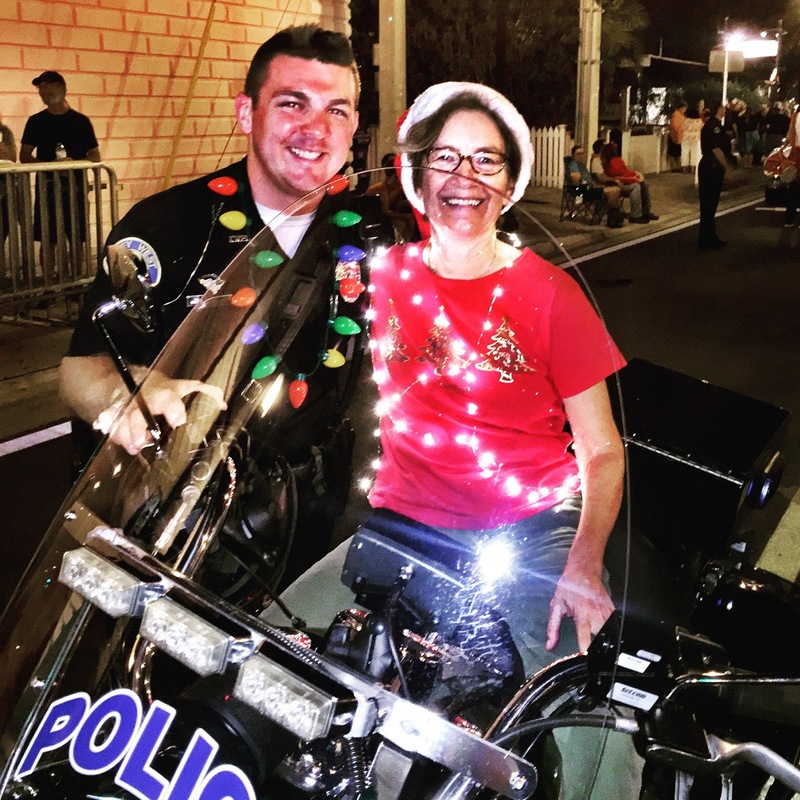 It sounds lovely Grace--I hope you'll be able to see the lights in spite of your boot! I love all the Key West festiveness! My town has a huge beautiful tree with white lights all over in Market Square downtown, and many antique houses with electric candles in the windows. Five inches of snow yesterday, so it's very pretty. Unfortunately we're getting freezing rain all day today to spoil it and make driving for last-minute shoppers treacherous. Alas. Merry Christmas! Pretty much like Key West only bigger. Kudos to the Key West marching band, by the way. Christmas isn't Christmas without band music, at least in my world. The illuminated sousaphone was outstanding, and all the players sounded just great. Yes love love the lights on the instruments! My grandson is in seventh grade, and plays saxophone in his grade's band. I went to Detroit to see him play a couple weeks ago, and it occurred to me that's where the high school marching band musicians will come from. Zak and I are going to see the Nutcracker tonight, so I'll talk to him about this. Thanks for reminding me, Gigi. Music Hall just did a major renovation, part of which included removing 1,000 seats to make room for moving the stage out into the audience. The pit is much more visible than it used to be, so I hope Zak and I can go down at intermission (we have seats at the front of the first balcony) to see the instruments. The Cincinnati Symphony Orchestra is amazing, and Carmen DeLeone has directed the Ballet music for decades. We are really fortunate to have had him so long. 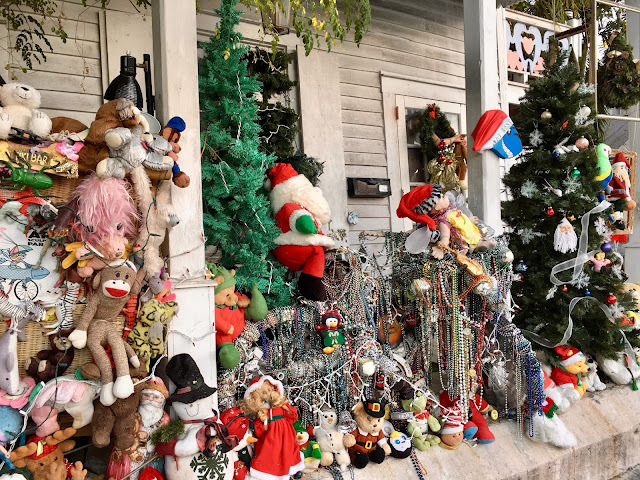 There are some streets where the houses are so beautifully decorated that I think the neighbors get together to coordinate their decorations with each other. On Christmas Eve, after church, I like to drive around one of the historic districts to check things out. A few days after Thanksgiving as I drove home from work I saw someone in a ladder truck stringing lights around a huge tree that always looks festive. I always wondered how the owners managed to get the lights all the way to the top! Thanks for the cool pictures! When we lived in Wilmington, NC, there were a few neighborhoods with some very competitive decorators. The displays escalated from year to year as they tried to top their neighbors. We would drive around and ooh and ah, and then sigh for the expenditures of cash and electricity. There is less of it in Durham, or perhaps it's in neighborhoods that we haven't seen. There are a couple of big Christmas parades, for which traffic through much of downtown is blocked off. We're in Maryland now, and enjoyed seeing some restrained decorations in my sister's neighborhood, along with some of those giant blow-up toy soldiers. This is the time of year when I miss my longtime across-the-street neighbor Jean Murphy who had a life-sized goose that lived on her front steps and was dressed for whatever holiday/season it was. At Christmas of course that duck had a Santa coat and hat. Waving: Jean! Our neighbors to one side have an enormous blow-up snowman and Santa that glows at night, to the other side twinkle lights. Our whole town lights up pretty much... except for us. We put greenery on the front door and enjoy everyone else's spangles and glitz. Our grandchildren from Brooklyn are coming tonight and we look forward to driving them around and taking in the lights. It will the one day of the season when I'm glad it gets dark so early. Did the kids make it? TERRIBLE weather! Thank you, Lucy, for all the photos. For me, today, the best one is the lighted palm trees, because one week from today I will be looking at them in Deerfield Beach as I escape Connecticut cold! Happy Twinkly Lights Season to all! Have a wonderful time in warmer climate Elisabeth! Cincinnati decorates, but because our house sits so far back I usually just hang wreaths front and back and call it done. Tonight my grandson and I are going to see the Nutcracker ballet in the newly restored Music Hall, which I'm sure will be decked out. I'm planning to drive around downtown a little so we can see Fountain Square, too. I have not been downtown at Christmas in decades, but they usually have a skating rink on the square, and also at a park on the riverfront. I'm with you on the wreaths, Karen. At least the one on the front door has some lights. I'm such a kid at heart. I love driving around looking at lights. And Karen, I took my granddaughters to rhe Nutcracker last Tuesday's! Magical. Best ever! In San Francisco? I'm looking forward to it, after not seeing it performed for so long. We are all lit up inside and out, and so are most of the houses in our neighborhood. Which is I. Walking distance of seven of the eight synagogues. Go figure! I’ve been in Key West for that parade. Thank you Lucy Roberta The pictures are a treat. The fishes are all bought for tomorrow’s cioppino , not seven but five. We are tucking in intil mass tomorrow, morning and midnight. It will be lovely and exhausting. My neighbor the cardiac cath plan RN is on call this weekend and is there saving lives as we speak. So I’m making her some sausage rolls to say thank you. I’ve spent many a Christmas working and know how that feels. thanks Ann! I'm sure she'll appreciate the sausage rolls. 7 synagogues in walking distance? that's simply amazing. Thanks for sharing the pictures. Looks great to me. Oh Lucy, you know how I love Key West and Haley Snow. 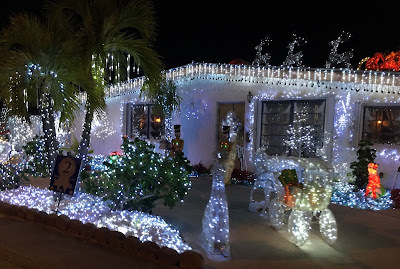 I was fortunate to spend a Christmas in Key West when my daughter and son-in-law lived there. It was truly a magical experience. The lights are amazing and the Christmas spirit is the Key West spirit on steroids. Hahaha! We had a lovely Christmas Eve meal at a fancy restaurant (I want to say Michael's, but I'm not quite sure), and then on Christmas Day, some of our party went fishing, so we had the most delicious fish in the world that day, cobia cooked outside on the grill. The town here in Owensboro, KY is decorated nicely with lots of lights and holiday decor. I love seeing the houses lit up, too, and a glimpse of the cozy scene inside with the Christmas tree. I go on a Christmas Open House tour with my mother-in-law, sister-in-law, and a few others each year, and it's so much fun to see how beautifully and differently decorated the inside of the featured homes are. My favorite town at Christmas time is still my hometown of Maysville, KY. We were always likely to have some snow, not so here. I know it's the nostalgia of my childhood that colors my view of Maysville at Christmas, but it's a small town, so the main street always sticks out as special. I have as my FB cover photo a shot down the main street of town there at Christmas. Cold and clear here in Portland OR, low 30s days and high 20s at night. Yesterday we had freezing rain, and some of the more hopeful weather people are saying maybe a white Christmas, if only non-sticking flurries. We have an unlighted wreath on the front of the house, lights around the front door and in the living room, the tree is lit and decorated, packages under. I had my second eye surgery (for cataracts) yesterday, so things are a bit blurry today, but by Christmas should be bright and clear. Oh to be able to see clearly and read again is the best gift of all. The city of Portland Maine is always unique and lovely during the holiday season. 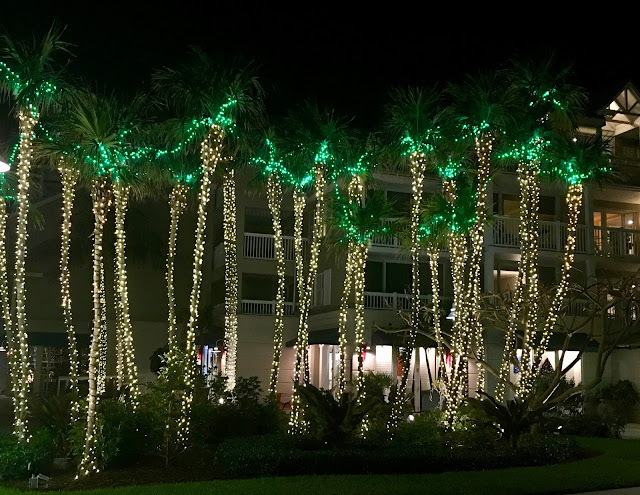 Instead of traditional Christmas lights, we have large abstract shapes in beautiful lights hanging from trees and floating up the sides of buildings. It's definitely going to be a white Christmas at home, as Maine has a major snowstorm moving in overnight. Here in Pahoa, it's a balmy 70-something degrees, and we're surrounded by incredibly lush greenery. Not seeing too many wreaths and swags, but many houses have gone all out with lights. The effect is less "light in the darkness" as it is in the Northeast, and more "Fiesta!" Such a good description of the difference in lights Julia! SO great! People are incredibly creative. Right now we're in the midst of a sleet storm, so the whole world looks like it's in black and white. We couldn't even walk down the driveway to get our morning papers!